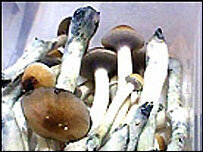 In recent months there has been an explosion in the availability of magic mushrooms available for sale in Britain. 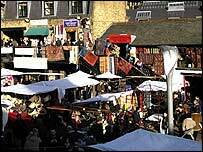 The hallucinogens have been appearing in ever greater numbers in High Streets and market stalls across the country, after it became known that their sale was legal if they were fresh. Now the Home Office has moved to close what it sees as a loophole that has allowed huge quantities of a Class A drug to be openly sold on city streets. Until now only the active ingredient in magic mushrooms, psilocin, had been banned. That had been interpreted to mean that "prepared" mushrooms, such as those that had been dried or put in products such as tea, were Class A drugs while fresh magic mushrooms were perfectly legal. But the Home Office's new Drugs Bill, published on Friday, includes a provision for all magic mushrooms to be considered Class A controlled drugs. The law would be amended to include "fungus (of any kind) which contains Psilocin or an Ester of Psilocin". It would mean anyone selling fresh mushrooms could face a life prison sentence. And it would bring to a halt a booming industry. The Home Office estimates that there are now more than 400 stores or stalls selling fresh magic mushrooms in Britain, up from less than 20 only 18 months ago. Independent research group DrugScope said some are well-organised distributors, while others were just opportunists set up on a roadside. Chris Territt, one of the directors of The Psyche Deli, a company which distributes fresh magic mushrooms, said customers could be put in danger if reputable wholesalers and retailers - the type who would actually adhere to a change in the law - were forced to stop selling the product. "The people who are buying magic mushrooms these days are teachers, doctors, lawyers. There are 60-year-old customers who said they were scared to try it in the past because they thought it was illegal but now they know it's not. "This is just yet another example of the government criminalising a section of the community who never considered themselves to be law-breakers. "There's a huge market out there and this will just drive it underground and into the arms of shady operators," he said. DrugScope said most retailers had been self-regulating by refusing to sell magic mushrooms to under-18s, advising customers on safe doses and warning against mixing them with other drugs such as alcohol. 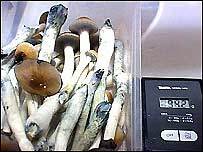 Mr Territt said: "Everyone who is currently selling magic mushrooms [in places like market stalls] has a stamp of legitimacy because distributors won't sell to them otherwise." He dismissed the Home Office's suggestion that the bill would give greater clarity on the legality of magic mushrooms. "It's just one line. They haven't sought to bring about any debate on whether they think it should be illegal," he said, adding that he was pleased such a debate would be forced by the bill's passage through Parliament. Such a debate, he said, should focus on whether magic mushrooms should be considered Class A drugs at all. DrugScope's Petra Maxwell agreed. She said that while the hallucinogenic nature of the fungus posed a danger to people with pre-existing mental problems, they should not be treated the same as other Class A drugs such as heroin. "You'd really have to weigh up whether it should be a priority for overstretched police forces."